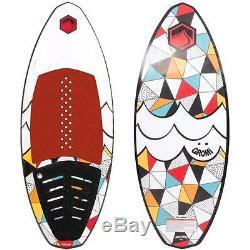 Single fin for classic skimming, a twin set up for that loose surf feel, or a tri for driving down the line. Compression Molded PU core Design. Beveled Rail Edge - Nose through Mid-Section. Single Concave into Slotted Tail Channel. Large Grooved EVA Deck Pads. 46 in 116.8 cm. 19.6 in 49.8 cm. Nose 4.5 cm Tail. The item "Liquid Force Gromi Kid's Wakesurf Boards" is in sale since Tuesday, June 06, 2017.